I was recently sent a review copy of Food4Wealth and I have to say I was impressed. The methods outlined in this publication (which includes a series of videos) is not exactly the same as those I've explained on this site, but that does not mean that they are wrong. We just take slightly different approaches. 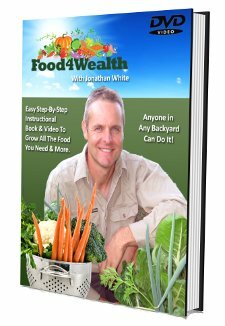 Food4Wealth is great for people just starting to grow veg, or indeed fruit, although Jonathan White, the author, also gives information on how to convert an existing vegetable patch to the Food4Wealth system. One of the most attractive things about this cultivation method is that it is a completely "no dig" system. You can't really get much better than that! Plus, because of the way plants are grown - not at all in a monocultural way (except for particular crops such as corn which require close proximity) - the yields are much higher than you might expect from such a small area. It is a totally organic method, and very easy to follow. The instructions are simple and clear, and it doesn't matter if you are a reader like me or prefer to watch videos, both types of people will find Food4Wealth accessible. Plus there's also a separate project plan. I recommend this book/video series to anybody interested in starting out in crop production for the family, or anybody already growing their own food who would like to give up digging! Article ©2010 Frann Leach. All rights reserved.